Every driver can experience car troubles at one time or another. Your engine may fail when you’re stuck in rush-hour traffic, leaving you stranded on a highway. Your vehicle might be struck by another driver and need repairs. Any number of other mechanical problems can affect your car and disrupt your schedule. When this happens, you need a professional to remove your car and take it to a secure place. A local towing company will be able to tow your vehicle away, but how do you choose a reliable one? Social media accounts are a major help in identifying which towing companies are reliable and which aren’t. They may share regular updates on their new equipment, introduce their technicians and invite customers to leave feedback. You can get a solid idea of the firm’s values and quality from their social media accounts, so take a few moments to check these out. While testimonials from customers on social media are a big help, you may be able to find more on dedicated review sites. These should be honest, unbiased opinions that cover the quality of service, pricing and more key details. Check the company’s website to see what certification they have and how many years they’ve been in business. If you just call the first number for a tow truck driver you find, you don’t know who you’ll be dealing with. Doing your research will pay off. The best towing firms typically run an extensive portfolio of services, including long-distance towing, local towing, flat tire change, gas refills, car lockout solutions and more. Calling a towing company that delivers various services means they will be better-equipped to help you if your car doesn’t necessarily need to be towed. The technician may be able to give you a jumpstart, replace the battery or perform another quick-fix that gets you on the road in next to no time. Reliable towing firms are upfront and honest about their prices. If the business you call is evasive whenever you ask for a quote or refuses to give you an estimate, it may be a warning sign. You should also confirm that there are no hidden charges or extra costs likely to be tacked on once the job’s done. Reviews from previous customers should indicate how ethical and transparent their pricing model is. You can find yourself stuck by the side of a road at any time, day or night, weekday or weekend. Many quality towing firms are available 24 hours a day, seven days a week, catering to drivers experiencing vehicular problems around the clock. 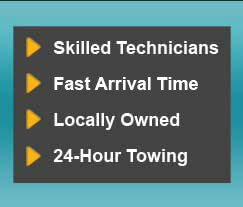 A 24/7 towing company is usually dedicated, so take their constant availability as a good sign. Choosing a reliable towing firm can be daunting, especially if you’ve never had to use one before, but follow these tips to make it easier on yourself. The right business will arrive quickly, keep your vehicle safe and charge a reasonable rate.